Hello and happy weekend everyone. It's time for my Saturday's Critter party. I hope to see you and your critters there too. It has been an awful week here with snow, ice, freezing rain and a day with no power. I am trying hard to catch up with the post and leaving comments but I seem to be lagging behind. The one day with my power off and no internet service is the reason. I hope everyone has had a great week. I am looking forward to the weekend...and to SPRING!!!!!!!!!!!!!! 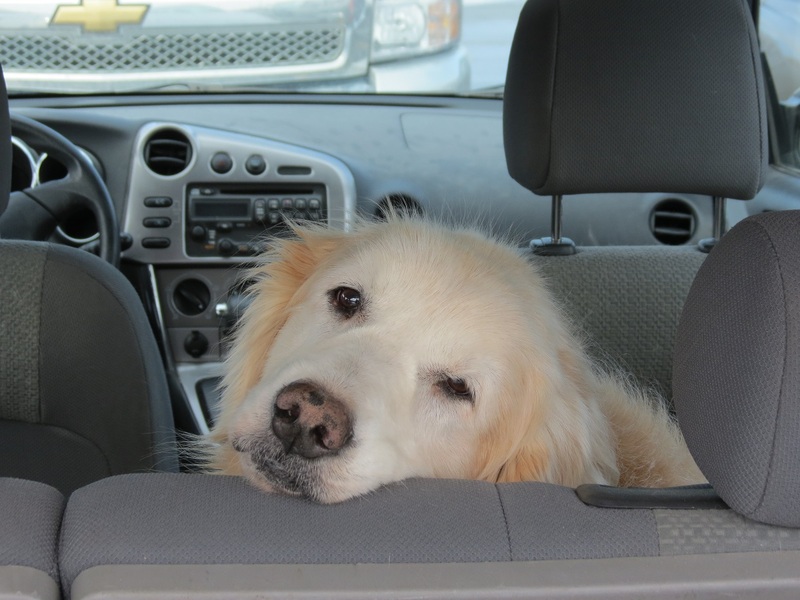 Goldie Girl loves car rides, she even enjoys going food shopping with hubby. 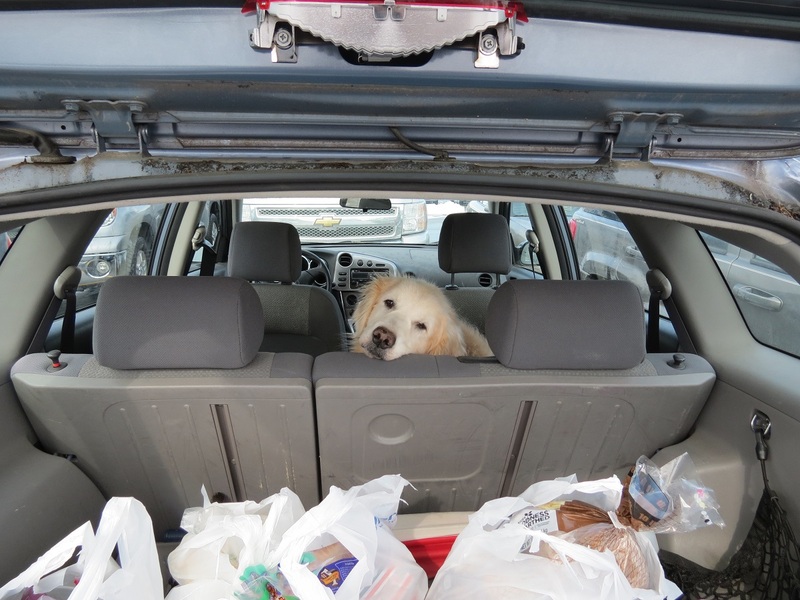 Here she is watching hubby put the groceries in the back of the car. Back at home, I will see the House Finches visit my feeders. The male is colorful with his red head and chest. Sorry the weather has prevented our usual weekend outings. I am hoping for a decent weekend to do some birding..
Good morning Eileen!You sure have an awful weather!I hope it gets better very soon!Goldie Girl is so sweet! !What a beautiful bird!I feel sorry for them out there in the cold! Wonderful images!Have a warm and safe weekend!Thank you for hosting my post!Hugs!! Goldie Girls seems to be saying "Hey dad, What's in those bags for me?" Have a great weekend Eileen. Thanks for hosting and I hope it warms up soon for all of us. HI Eileen I do not know it my comment went through on this post however I wanted to know if there is a 'thing' I can put in my side bar like Stewert has? NOw if there is, please (in very simple language) tell me how to put that in there please. Here in South Western PA we did get that ice...I got some nice pics...but maintained power. So sorry that you lost yours ..it is far too cold for that, ugh. Goldie is adorable and your housefinch is beautiful..Looks so cold! Happy weekend! Mój piesek też lubi jazdę samochodem, ale nie jest taki spokojny jak Twój. Zdjęcia kardynała jest sliczne. Pozdrawiam. My dog also likes to drive a car, but it is not so quiet as yours. Photos of Cardinal is very pretty. Yours. We didn't get snow here not even a day all winter in Izmir but i am longing for spring too, Eileen. Goldie is so sweet! You can tell she loves the car! Very pretty Finch!Hope you weather improves soon ! Goldie must have a snack or two in those grocery bags- she's watching! She is such a sweet dog. I LOVE!!! the close up of Goldie Girl! She's a doll. Of course, you know that already. Goldie Girl is such a sweetheart....looks like she is hoping there is a treat in those bags for her. So sorry about your bitter weather. We are all anxious for spring! The finch photo is lovely, too. Hope you enjoy the day. I appreciate you hosting and I look forward to visiting everyone! Goldie Girl's sweet face warms my heart! And your finch pic made me wonder why we don't that finch variety here in Michigan. What is the secret . . .
Goldie girl has such a loving face. I hope you guys warm up soon. We have great temps at the moment 82°F. Hi Eileen, your dog Goldie is so beautiful, the bird is also beautiful. Goldie Girl is so incredibly adorable!!! Your sweet puppy just happy to be with you, never mind the weather! i just love your sweet goldie girl. :) thanks for hosting, eileen! It's always a delight to see your beautiful Goldie Girl. Try to stay warm! oh eileen, so sorry you didn't get to take your regular walk. seeing your pictures is something we bloogers enjoy just as much as you enjoy taking them!! your goldie is so sweet. those eyes could melt your heart. it's so easy to see why you love her so much!! You receive such a beautiful gift. Hi Eileen - Goldie is such a sweetie. Don't feel too bad, we haven't been out hardly at all this winter. 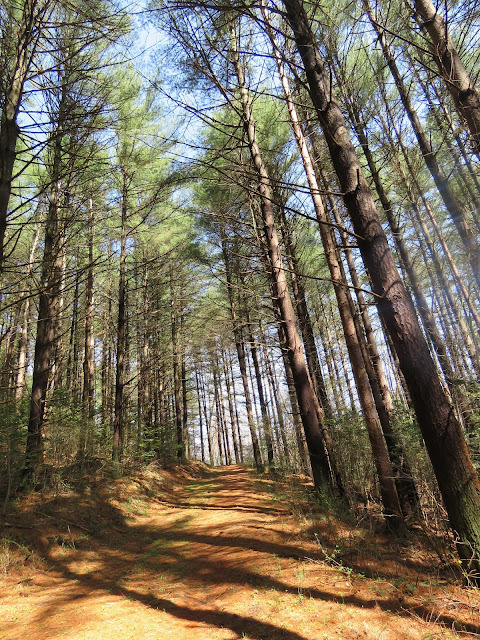 There are no deer to see as a rule, no Antelope, and not many birds either. We finally just decided to stay home more, at the price of gasoline. Goldie is such a sweetie! Lovely shot of the finch! That second picture is just too cute for words! Sorry to hear about lack of power and awful weather conditions. Great shots of Goldie Girl and the Finch. Have a great day! Goldie looks sweet - and love the finch on ice! I am longing for Spring! Cute expression of Goldie Girl. Poor bird in the extreme coldness. Stay safe and warm, Eileen. Sorry to hear about your power outage and bad weather. We are having snow, snow and more snow tonight. I'm ready for spring too. Goldie Girl is adorable. I love the close-up. She's so cute! I think she's waiting for a snack. The groceries must smell so good to her. Goldie girl is so sweet. Cool dog, he seems to like driving. Goldie Girl is absolutely beautiful. Good of her to help your husband grocery shop! Your house finch is a charmer, and I think it's wonderful that you can get even one picture of a bird in your horrid weather. Take care, stay warm, and I hope it improves soon. Goldie Girl looks so sweet. My dog Hiker also loves to ride in the car. She doesn't care where we go as long as she gets to go. it´s been thawing here for three days now so the snow is almost gone again. Sorry to hear you were out of power. That is not fun nowadays. Goldie Girl is such a sweet dog! Your house finch is pretty. Oh yes, I love that one, well done Eileen. Beautiful dog i would take her shopping too. That's a cute picture of Goldie Girl looking back over the groceries. I hope we all get some waker weather soon. Eileen your Goldie Girl is such a sweet looking soul and a beauty of course ! Your goldie is a beautiful pup. Lovely post, Eileen. Look at that sweet face peering over the back seat! Whenever we've been hunting at the grocery store for our pack, Topaz has to inspect all the things in the bags. We'll all be more than ready for spring this year! Your Goldie Girl is a sweetheart! The weather has curtailed my activities, too, over this winter. Your Goldie girl is sp pretty! She seems so content, riding the car! Hi Eileen, I understand about the weather and bird watching. I have not taken any pictures since Thursday due to rain. Your pictures of Goldie are darling! 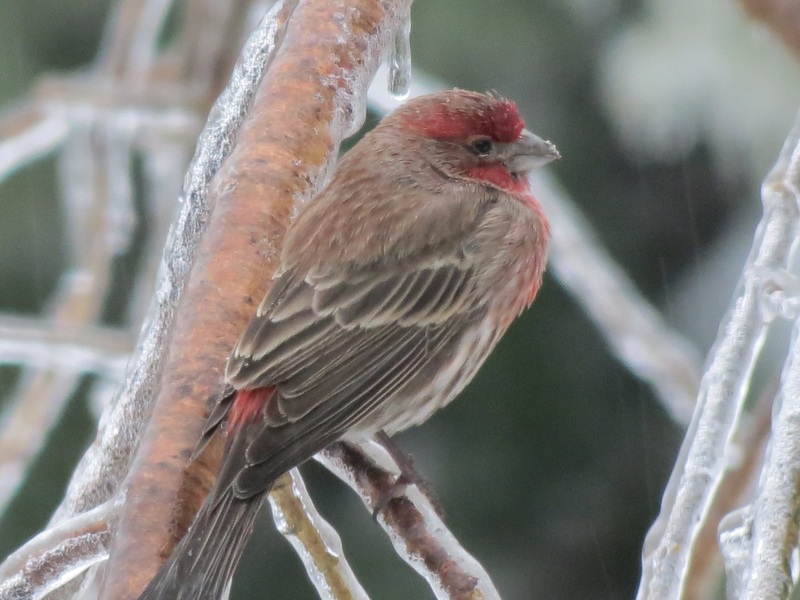 Poor little House Finch looks really cold. Have a good Sunday and stay warm. Hope you do get some birding in this next week! Your dog is so lovely! Dog looks so cute and comfy! I see your girl Goldi loves riding car. I know my Bellusia also loves it. Your Goldie Girl is a cutie! It seems you have a hard time with cold and snow.... poor little birdie is sitting on a branch covered with ice. What a sweet, sweet girl. One of my dogs just loves going on an adventure in the car. The other - it took 4 yrs but finally she is relaxed. They just want to be with us! your goldie girl is such a cutie! gorgeous shots as always, eileen. Goldie is so cute love the way she is looking at your hubby. Happy Monday! Love Goldie's sweet face. Looks like a lot of ice on your branches. Goldie Girl is so cute! My Nala never sit in the car like her. I'll be back here with my Critter's post! Delicious photos Eileen. Your dog as a companion comfortably in the car and he looks at you, or he wants to say: Is there something hahahahaha ... Finch is also a wonderful picture with its beautiful red color. The critters are quite nice to be right on eht blog of those to come. Just love that second shot of Goldie Girl. A beautiful dog!